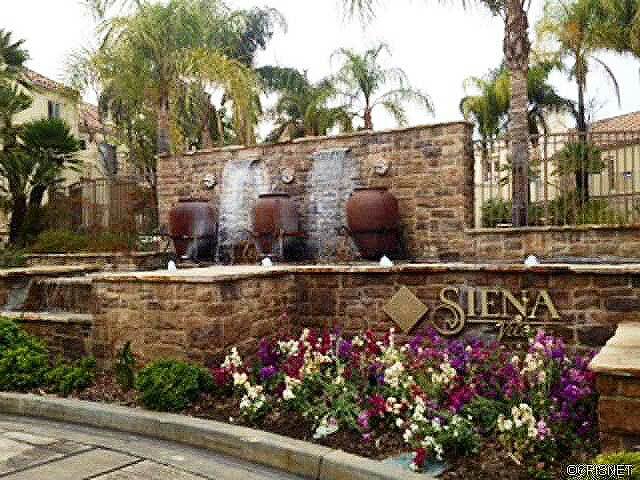 24101 Del Monte Drive, Unit 417, Valencia, CA, 91355 new listing as of 02/19/2014 in the Valencia 1 neighborhood, Siena Villa condominium tract of Valencia CA in the city of Santa Clarita CA. This great lower lever 1 bedroom 1 bathroom condo has 693 square fee close to YMCA, Valencia town center and Valencia paseo system. See more below. Move right in!!! Super sharp 1 bedroom 1 bath lower unit home with fresh interior paint and beautiful pergo wood flooring throughout! Clean and bright looking kitchen with white cabinets and white tile counters, recessed lights, new stainless steel appliances and new faucet, new garbage disposal and a big stainless steel sink too!! Ceiling fan in dining area. Living room features a fireplace with slider to patio area. Master has walk in closet and slider to patio. Vertical blinds! Updated bathroom with new faucets in dual sinks, new toilet, and light fixtures! 2 car tandem parking with storage! Schools for this home are Hart High School and Placerita Junior High School. All excellent schools and one of the reasons many new home owners with children find reason to purchase in the Valencia 1 neighborhood of Siena Villas.